Note that the M.A. 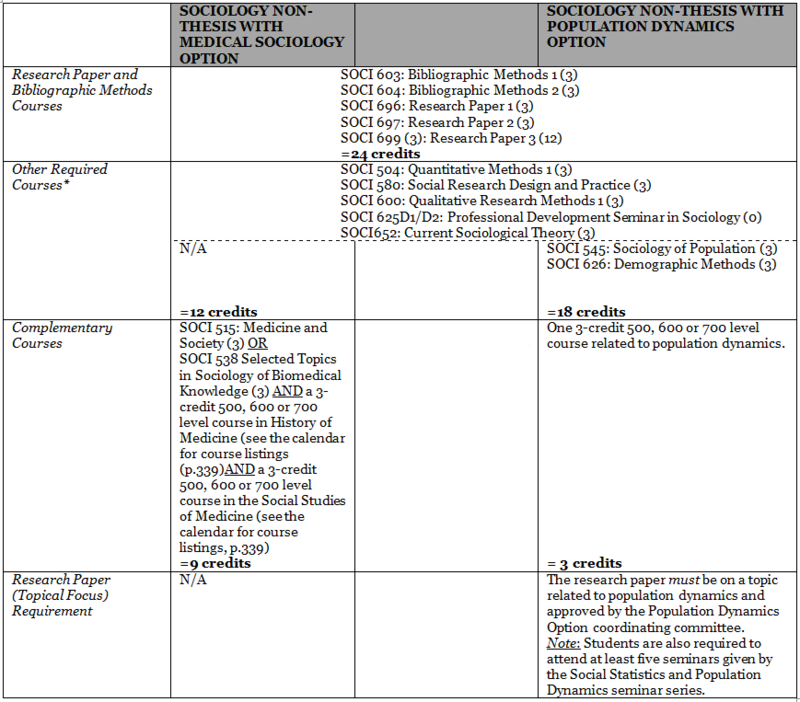 program in Sociology and related options is primarily organized around the non-thesis degree. The department only accepts students into the M.A. Thesis option under exceptional circumstances. Our MA programs enable students to develop an excellent range of research skills and knowledge – valuable for those intending to eventually pursue jobs in a vast array of fields such as business, education and government. An MA in sociology from McGill is also well-regarded among the world’s top universities and serves as an excellent launching off point for students intending to pursue doctoral studies. A Master’s degree in sociology at McGill can be achieved in two ways: via coursework and the writing of a thesis or alternatively, by coursework and the writing of a publishable-quality research paper. The thesis program route typically provides students with the opportunity to gather their own data; in contrast, in the non-thesis program, students generally rely on secondary data sources in order to craft a publishable-quality paper. The duration of the thesis program typically ranges between one and two years, depending on a student’s background and success in developing a thesis topic. The non-thesis program is designed to take one full year to complete. The majority of students pursue the non-thesis route – particularly those wishing to advance to doctoral training in sociology. All candidates for a sociology MA degree – thesis and non-thesis – must complete the degree in three years. Note: The Sociology Department’s graduate programs are governed in vital bureaucratic matters (e.g., residency, additional sessions, leaves of absence, withdrawal, plagiarism and cheating) by Graduate and Post-Doctoral Studies (GPS). Students may consult the GPS website and the university calendar for elaboration. Students entering a sociology MA program are required to spend three terms in residence at McGill. In order to be considered full-time, students in residence must register for a minimum of 12 credits per term in both the thesis and non-thesis programs. There is no residency requirement while the student is writing the thesis. Incoming MA students are required to demonstrate a knowledge of basic statistics before enrolling in SOCI 504. Preparedness is assessed via an exam given at the start of the fall term. To qualify for SOCI 504, a student must pass the exam with a score of at least 75%; those who do not must take SOCI 350 and receive a B+ grade or higher in order to advance to SOCI 504. To provide students with some research experience, all students in this program must prepare a thesis based on their own research. While not necessarily requiring an exhaustive review of work in the particular field of study or a great deal of original scholarship, the thesis must show familiarity with previous work in the field and demonstrate the ability to carry out research and to organize results, all of which must be presented in good literary style. 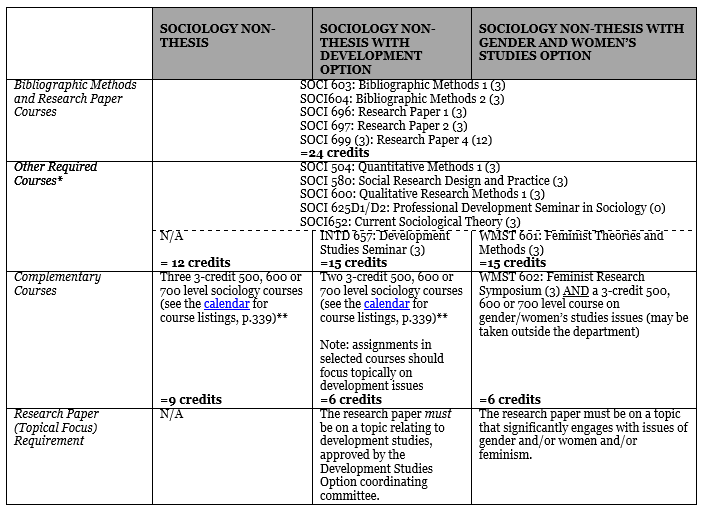 Students may elect to pursue either the standard sociology MA thesis program or they may couple it with one of three ‘options’ in 1) development studies 2) gender and women’s studies or 3) medical sociology. Such options enable students to acquire a cross-disciplinary specialization. Coursework and thesis foci requirements vary in accordance with the option selected. *Students granted an exemption from any one or more of these courses by the Graduate Program Director must substitute another substantive seminar in its place. **Students may take a course in a related field, with the approval of the Graduate Program Director. Each student is responsible for finding a faculty member willing to serve as his/her supervisor for the MA thesis. In cooperation, the student and supervisor select at least two faculty members, one of whom may be from outside the department, to sit on the thesis committee. Approval of any external appointment must, however, be obtained from the Graduate Committee. Students may consult the Graduate and Postdoctoral Support website for guidance about supervisor-supervisee relationships. An MA proposal must be submitted to the supervisor by the end of the first year (i.e., August 31st). It should not exceed 15 pages in length, double-spaced. The proposal should include a discussion of methods and data to be used, hypotheses and a justification of the research. The thesis supervisor then convenes a meeting of the thesis committee to discuss and secure approval of the proposal. The main purpose of this meeting is to supply the student with advice as to the feasibility of and possible problems with the proposed project. A copy of the accepted proposal must be filed with the department. There are numerous university requirements regarding the content and format of the MA thesis. Please consult the GPS guidelines. MA theses can be submitted at any time but there are set deadlines set by GPS for each graduation date. Please see GPS’s website for deadlines. MA theses must be evaluated by one ‘external’ examiner. S/he must be a scholar of established reputation and competence in the field of the thesis research. The examiner may be from inside or outside of the university. Please see GPS’s ‘Thesis Examination’ guidelines for details on thesis examination. This program culminates in a publishable-quality research paper that normally, but not necessarily, flows out of a paper written for one of the graduate seminars or an independent reading and research course. Comparable to an article in a professional journal, the paper should focus on a clearly delineated research problem, demonstrating familiarity with the most important relevant scholarly work and the ability to carry out research and organize results. 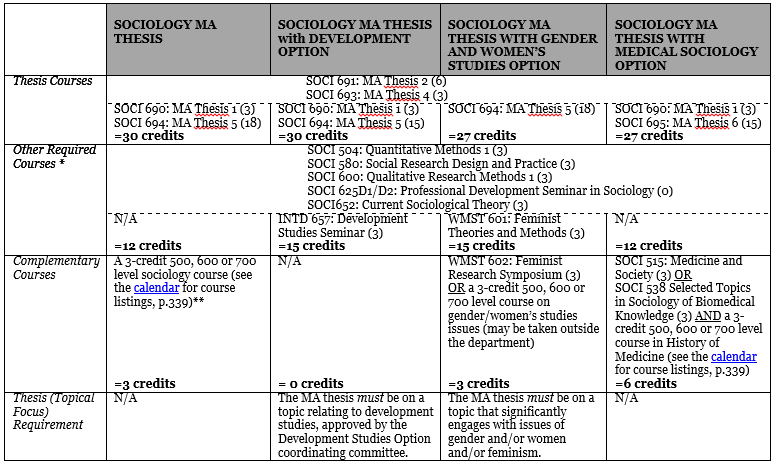 Students may elect to pursue either the standard sociology MA non-thesis program or they may couple it with one of four ‘options’ in 1) development studies 2) gender and women’s studies 3) medical sociology or 4) population dynamics. Such options enable students to acquire a cross-disciplinary specialization. Coursework and research paper foci requirements vary in accordance with the option selected. *** Sociology Non-Thesis with Social Statics Option is no longer being offered. Each student is responsible – ideally, during his/her first semester – for finding a faculty member willing to serve as his/her supervisor for the MA research paper. Students may consult the Graduate and Postdoctoral Support website for guidance about supervisor-supervisee relationships. If a student intends to revise an existing seminar paper for the purposes of an MA research paper, s/he must submit the original paper to the supervisor for approval along with a one-page outline of the proposed revisions to the paper. A more elaborate proposal, of approximately five pages (double-spaced), is required where a seminar paper does not serve as the basis for the MA research paper. The MA research paper should be no longer than 30 pages in length, double-spaced, exclusive of footnotes and references. The courses - SOCI 696: Research Paper 1 and SOCI 697: Research Paper 2 - are graded on a pass/fail basis. The deadline for submission of the MA Research Paper is August 31st. It should be submitted to the Graduate Program Coordinator who will then relay it to the supervisor and the ‘second reader’ for marking. With the student’s consent, the supervisor will make the request of another departmental faculty member to serve as ‘second reader.’ Once chosen, the supervisor should notify the Graduate Program Coordinator as to who will act as the ‘second reader’. Both the supervisor and the ‘second reader’ read the paper, assess its quality and allocate a numerical grade, based on the McGill grading scale. The two grades are then averaged, generating the final grade for SOCI 699. A student may register for one independent reading and research course as part of his/her complementary courses. Reading and research courses provide an opportunity for students to study a topic of interest in greater depth in an independent way. These courses are negotiated between a student and a professor on an individual basis. Students must complete the ‘Reading and Research’ form detailing the nature of the work involved and the method of evaluation. The form must be signed by the student, the professor overseeing the course and must be returned to the Graduate Program Coordinator. Subject to the requirements of a student’s elected course of study and with the approval of the Graduate Program Director, students may take a course in another department (e.g., epidemiology, anthropology). Language courses require the approval of the Graduate Program Director and GPS; in some instances, student may incur additional costs for such courses. Students may take a graduate course at another university, when needed, in order to meet their MA program requirements at McGill. Students interested in pursuing coursework at other Quebec universities are eligible for a Quebec Inter-University Transfer. Students interested in universities located outside Quebec should confer with the Graduate Program Coordinator as to the current procedures for authorizing such exchanges.